Escolha a sua própria aventura no país do vinho australiano com este tour privado de 7 horas pela região. Viaje em um veículo de luxo Mercedes para uma região vinícola adjacente a Melbourne de sua escolha: Macedônia, Heathcote, Península Bellarine, Península Mornington ou Vale Yarra. Almoço, degustações e transporte de ida e volta de suas acomodações na área de Melbourne incluídas. Comece o seu dia no país do vinho com uma coleta conveniente em suas acomodações (casa ou hotel) por volta das 9h30; no entanto, o cronograma é flexível e pode ser adaptado para atender às suas necessidades. Conheça o seu guia e condutor dedicado e, em seguida, entre no seu veículo de transporte privado de luxo da Mercedes. Prepare-se e dirija-se ao destino do país do vinho de sua escolha; locais populares incluem a Macedônia, Heathcote, a Península Bellarine, a Península Mornington ou o Vale Yarra. Visite tantas vinícolas e atrações quanto o tempo permitir; o tour de 7 horas geralmente tem tempo para chegar a cerca de cinco vinícolas. Você também pode ir para a vida selvagem, visitar uma destilaria, uma cervejaria, uma cidra, um diário ou uma loja de chocolates. O almoço e todas as degustações estão incluídos, assim como o retorno ao seu ponto de partida original ou outro local de sua escolha. This is one of the best wine tour I had so far. The driver was not just a driver but also very knowledgeable about wine. After he picked us up from the hotel, he did first ask us the kind of winery we would like to go. We did tell him a few in a wish list and he was very accommodating. After going to first one, he already knew we were looking for something more special and introduced us a few boutique-y winery which were very good! During one visit, we also had good conversations with the wine maker who used to work at one of the famous big name there. This private was exactly what we needed, we can have the flexibility and also to avoid the very touristy winery visits. And at the same time, the driver who knows wine also makes the trip more interesting. I would highly recommend to those who wants to know more about Australian wines as well as wine connoisseurs. We took this tour right after Christmas, a busy summer season in Australia. Our driver picked us up at our hotel and took us to 3 different types of wineries. First was a major, very touristy one. At the second winery, he selected wine paired with cheese appetizers for us. The third was a small winery where the owner made the wine and the pizza for lunch! We are not connoisseurs, but wanted to see the Australian Wine Country since we are from the Finger Lakes of central NY where there are over 150 wineries. 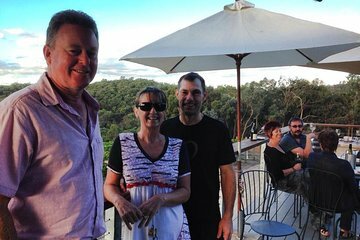 The private, made-for-us tour was exactly what we wanted - beautiful scenery, the driver was very professional and good company, and we learned a lot about wines in Australia, suitable to our personal taste.